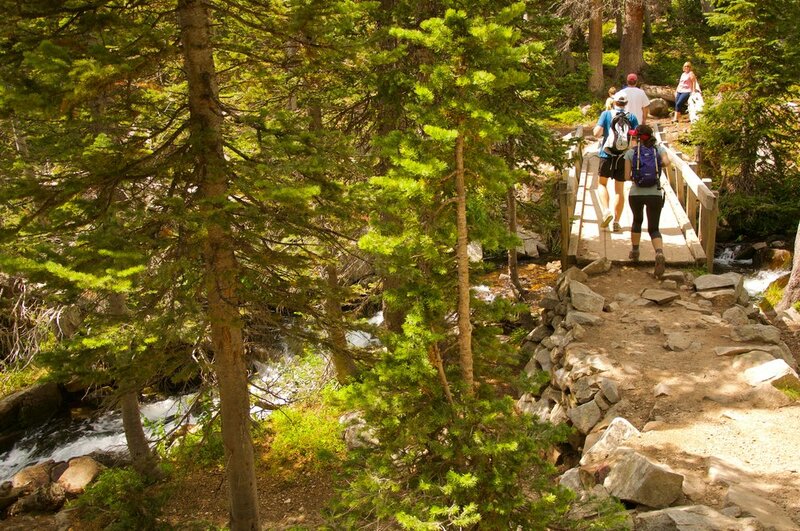 Description: Brainard Lake Recreation Area (BLRA) offers some of the best hikes to get you up close and personal to the Continental Divide in the Indian Peaks. 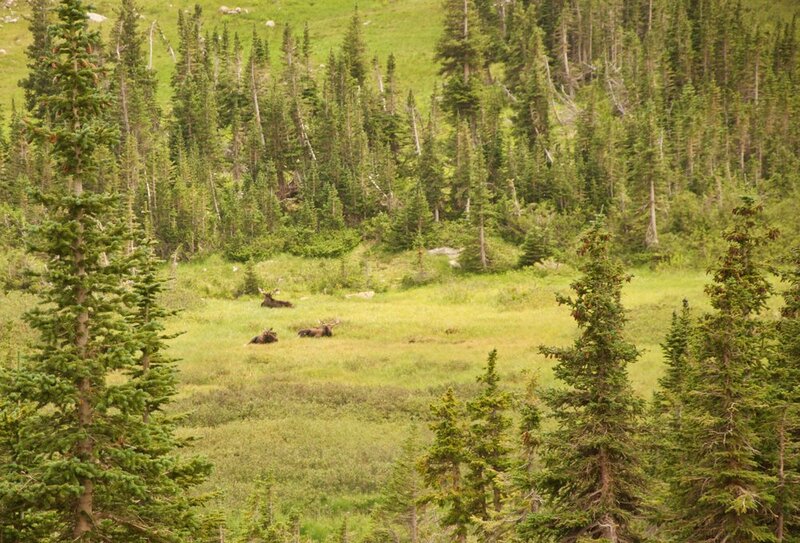 Bounded by the sleeping giant of Niwot Ridge to the south and prominent Mt. Audubon to the north, the glacier gouged BLRA consists of a group of five beautiful alpine lakes. To the south, sheltered in the safety of Apache, Shoshoni and Navajo Peaks are Long Lake and Lake Isabelle. To the north, in communion with Mt. Toll, Paiute Peak and Mt. Audubon are Mitchell Lake and Blue Lake. Blue Lake is by far the highest and deepest of the five major alpine lakes in the BLRA, rising well above the tree line at 11,340'. 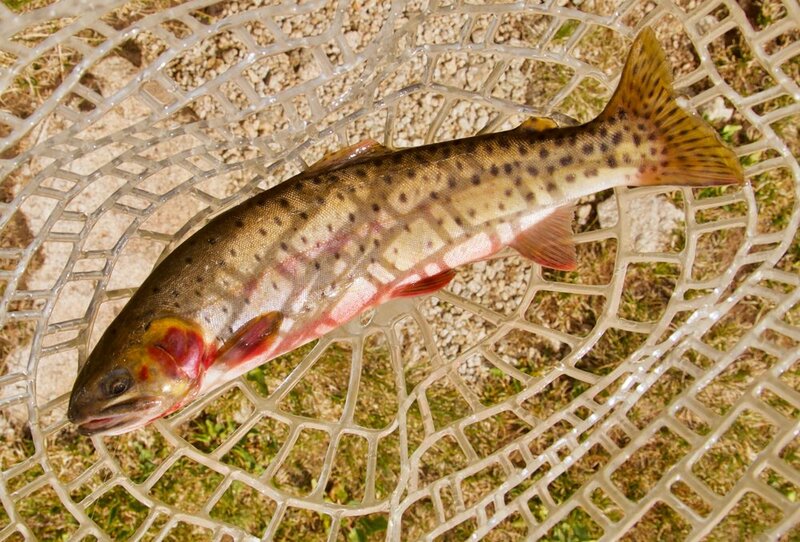 Its depth makes it a good spot for pulling in a few beautiful native Colorado Greenback Cutthroat trout if you are into fly fishing. But long before you make your way to Blue Lake you will discover the other beautiful alpine lake on this trip, Mitchell, hiding in a grove of Ponderosa pine, nestled under the shadow of Mt. Audubon. 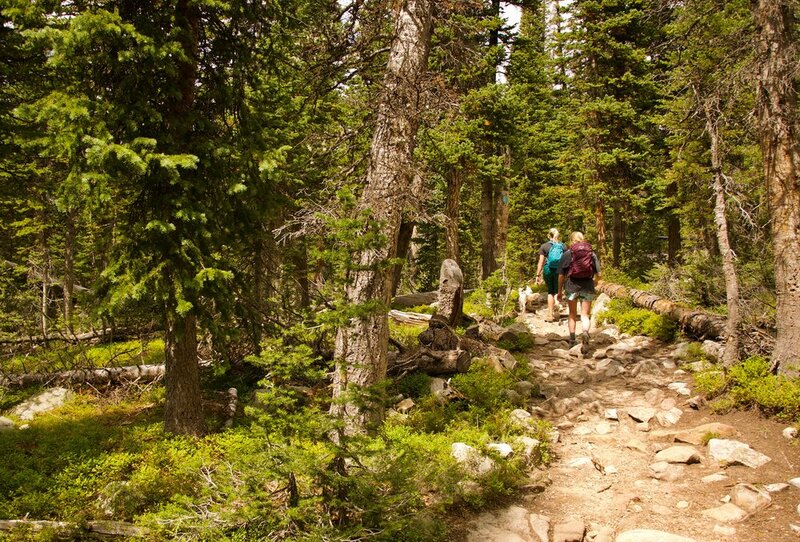 The trail to Mitchell is heavily shaded, crossing multiple streams, or 'cricks', which help to cool the hike on hot, summer days. Beyond Mitchell the trail becomes more challenging and open as you make your way from montane forest, through sub-alpine scrub to fully-exposed alpine terrain by the time you reach Blue Lake. Easy Challenge Level to Mitchell Lake only: Somewhat Easy, Up To 4.5 Miles, Up To 335' Total Elevation Gain - If this will be your first time to the BLRA it's good to understand that the length of your hike depends greatly on where you have to park. From the Mitchell Lake trailhead this hike is a maximum of 2.5 miles and 200' total elevation gain. Unfortunately, during the summer months most traffic is directed to the overflow parking area which can add up to 2.0 miles and 135' of elevation to your roundtrip hike. Using the elevation profile below, Mitchell Lake is reached just before the one mile mark, after about 200' of elevation gain. It's a trail with lots of small impacted boulders we love to call baby heads, which makes it nice to have walking poles. It climbs gradually through the Ponderosa along a shaded path to Mitchell and thus makes this an easy and very peaceful hike for most visitors. If you plan to continue on to Blue Lake, please read the information in the next paragraph. Difficult Challenge Level for Mitchell and Blue Lake complete hike: Moderately Difficult, Up To 7.5 Miles, Up To 1,124' Total Elevation Gain - If this will be your first time to the BLRA it's good to understand that the length of your hike depends greatly on where you have to park. From the Mitchell Lake trailhead this hike is a maximum of 5.5 miles and 989' total elevation gain. Unfortunately, during the summer months most traffic is directed to the overflow parking area which can add up to 2.0 miles and 135' of elevation to your roundtrip hike. Using the elevation profile below, Mitchell Lake is reached just before the one mile mark, after about 200' of elevation gain. It's a trail with lots of small impacted boulders we love to call baby heads, which makes it nice to have walking poles. It climbs gradually through the Ponderosa along a shaded path to Mitchell. However, beyond Mitchell the trail becomes much more aggressive, climbing 789' in under two miles with a couple of sections of long, steep rocky steps. 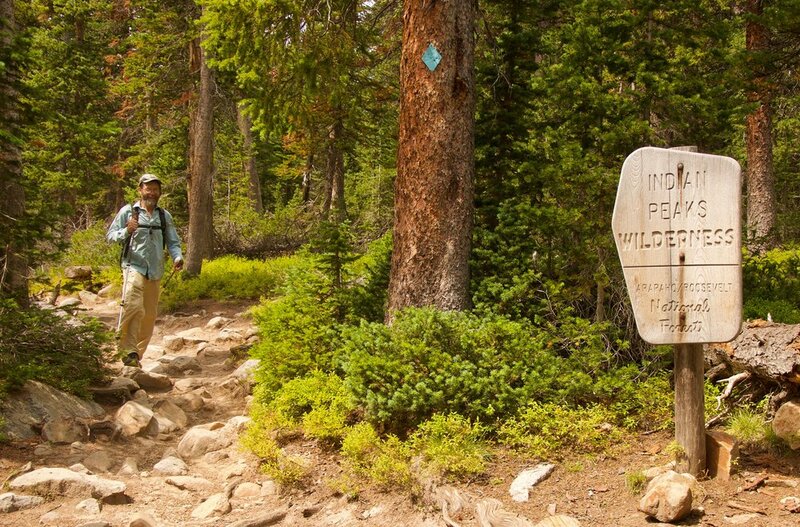 All that, combined with a finishing altitude of 11,340' puts the full hike to Blue in the Difficult category for those not used to climbing at elevation or mountain hiking. Parking: Parking in BLRA is now mostly limited to the overflow parking at the beginning of the Brainard Lake loop road. There is still limited parking at the trailhead but don't count on finding a space unless you come very early. 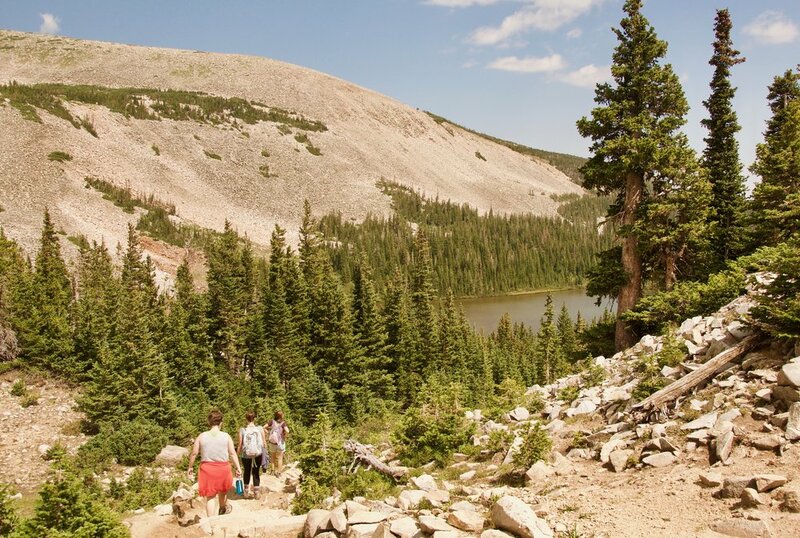 The road can be used in summer months to drop off riders or supplies at a picnic table around Brainard Lake or the trailhead, as it's a favorite picnicking spot for visitors. If you park in overflow the first and last mile of the Mt. Audubon hike will be on asphalt. Trailhead: To get to Mt. Audubon/Beaver Creek trailhead from overflow parking head toward the restrooms located at the west end of the parking area near the Brainard Lake spillway. Cross the spillway on the old loop road and make your way around the north side of the lake. Just before you come to a stone bridge crossing Mitchell Creek, you will see a new trail (opened in 2017) that will take you toward Mitchell Lake Trailhead. The trail will split in a short while, continue to follow the directions toward Mitchell Lake. The trailhead is just to the left of the ranger's information shed. 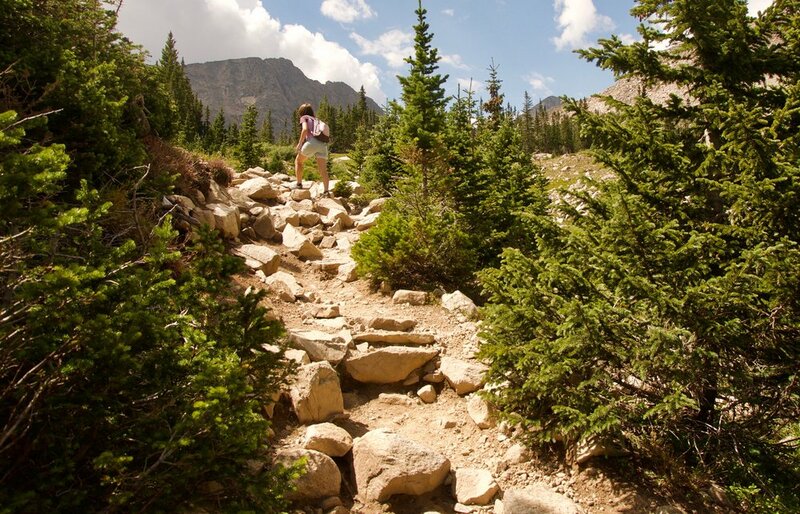 Trail Guide: The trail to Mitchell and Blue Lakes is a straightforward out and back about 5.5 miles long from the trailhead. About a 1/2 mile into the hike you will cross the tail waters from Mitchell Lake which even in late August were still flowing strong. Lots of tree cover and and proximity to Mitchell Creek keep the trail feeling cool and comfortable. Take care with the abundance of baby heads and tree roots which cover parts of the trail. Just before the one mile mark you will spy Mitchell Lake to your right. Walk down to the water's edge for a great view across the lake of the two ridges that make up Mt. Audubon's signature bowl. Audubon's peak, at 13,229' is obscured by the closer ridge but fear not, you will have great views of it as you approach Blue Lake. 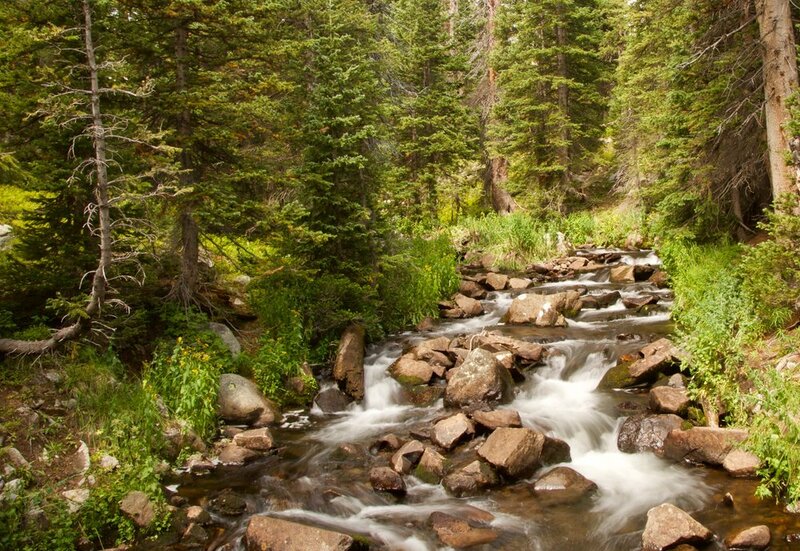 From Mitchell the trail will traverse, via large pine logs, a wide, shallow section of the feeder creek from Blue. Then, quickly the trail starts to rise aggressively over a series of stone 'staircases', the first quite long. As you rise in altitude the oxygen seems to quickly disappear, and the last 300' all above 11,000' can leave you breathless and dizzy if you aren't accustom to hiking at higher altitudes. Take lots of breaks, stay hydrated, and turn around if you feel you are getting altitude sickness or just can't catch your breath. But, if you do make it, you will be rewarded with a beautiful view of Blue Lake under the watchful eye of Paiute Peak just to the west on the Continental Divide. The trail continues around the north side of Blue, taking the adventurous hiker on toward Little Blue Lake under Paiute Peak. Relax for a while at Blue, recharge, and return the way you came, down past Mitchell and back to the trailhead and parking area. Après Hike: Part of the joy of this hike is the amount of crystal clear alpine lake and stream water you get to enjoy along the trail. You find yourself wanting to dip feet or more into the crisp, cold, clean water. While I was fishing up on Blue there was a couple jumping off a 20' or so bluff at the back of the lake into a deep pool. They actually sounded like they were enjoying it. Nuts, I say. But, I've been looking for a good segue to introduce the beers from Crystal Springs Brewing in Louisville, CO. We first met Tom Horst, the owner of Crystal Springs, at his home in May, 2013 during a evening porter tasting event. We sat on the terrace of his home, situated up Sunshine Canyon and sipped on his famous Doc's Porter watching the sun go down and nibbling on some great meats and cheeses from Cured, a Boulder Charcuterie. At that time Tom was brewing with three small tanks out of his garage. Today, Tom and his son brew amazing beers at their 657 S. Taylor Ave Taproom or their hip downtown tasting room at 604 Main St. in Louisville. While I'm a fan of their IPA and Doc's Porter, I have a special fondness for their Blood Orange Kölsch. Regardless of your beer tastes you are bound to find a favorite at Crystal Springs. Picnicking: Many beautiful options with tables and grills around Brainard Lake and Lake Mitchell parking area, and to the north of the overflow parking area. Take advantage of them and make it a full day of fun! Restrooms: Plenty at parking lots and trailhead.